If you have been following along with the aquaponics system I have been struggling with pH being too high since the beginning. This has had a negative effect on growth for far too long and I was beginning to get impatient. The results of my actions here are not entirely negative, but far from optimal. It started with my filling the grow beds with the wrong type of rock in the beginning, river rock containing calcium carbonate. This caused the pH to be stuck at 8.2 and no matter what I did (adding vinegar, phosphoric acid, etc) nothing would lower it below that. I then switched out all of the rock with a new type which is pH neutral and that made an impact right away. However, I could still not get the pH to drop much below 8, it would keep bouncing back. I then discovered that my hard water contained high amounts of calcium carbonate and so I added a filter to the auto top-off. This started to make a bigger impact and I was able to get the pH dropped down to 7.5-7.6 over a period of about three months. I had to keep siphoning off water and trying to let the new filtered water slowly replace the hard water over time. Having run this system at a high pH now for about a year I was starting to get impatient. This is where I went wrong. At this same period I was also just getting my new Tilapia added to the system and getting then used to the water conditions. I began looking for something stronger than the vinegar I had been adding to lower the pH and thought that a hydroponics pH down powered should do the trick. It was advertised as a pure phosphoric acid which would add phosphorous to the system and lower the pH. This was going to finally get my into the 6.5-70 range that I wanted to be at and I was excited to get the product and give it a try. I know that changing pH drastically is a bad idea, especially with new baby fish, especially with a full cycled system, especially when I didn't read the label and the pH down power contained Citric Acid! Citric acid is a powerful antibacterial and will kill the needed bacteria that are the heart of the aquaponics system. I started by adding the power one teaspoon at a time every couple of hours and testing the pH. The first day was exciting and I was able to drop the pH to 7, no fish dead, and all water tests looked good. Then I discovered the label with that listed citric acid as a component in this pH down powder. At this point I probably should have stopped using it but I was so close to getting the pH down to 6.5 and thought that if it was only a small component of the pH down product it would probably be ok. The next day I came down to the system to discover dead fish and ammonia levels off the charts. I had killed the bacteria colony and probably all of them. The new fish were struggling to survive and I quickly saved the surviving 17 of 30 and moved them to a small tank away from my stupidity. The silver lining here is that the pH is now at exactly 6.5, however it is going to take weeks if not months for the system to balance back out. Many veteran aquaponics system owners have a similar story to tell and so I thought I would share mine. I hope that this helps someone else out there to be careful and never add anything that contains citric acid! This is proof, even in small amounts it will kill the bacteria! 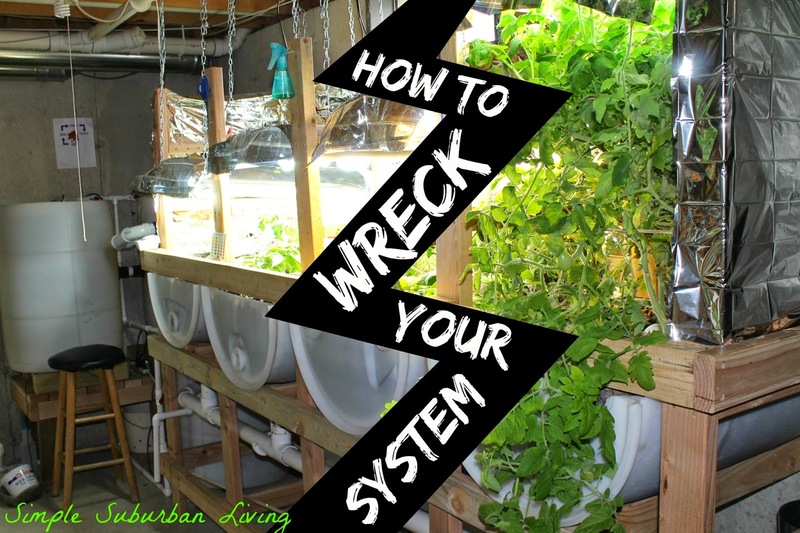 Hi, I'm Nate from Cleveland, Ohio and you truly inspired me to build an aquaponic system. My system is very similar to yours. However, due to lack of space, I only have 2 grow beds. I added my fish and waited about a month till my cycling was complete to add my baby crops. At that time my biological filter was established. I had a PH of 7.4, 0 Ammonia, 0 Nitrites and 20ppm Nitrates. Everything was going great till i noticed some defeciences with the plants. So i added some supplements; Rock Phosphate, Epsom Salt, Chelated Iron, and Soluble Potash. The Phosphate caused a huge Algae bloom. My plants were deprived of Oxygen and starving of nutrients. So i better shaded the area and added a pinch of humic acid. The water started to clear up and my plants bounced back. Since then, for about the past 4 weeks, my PH is 7.0, Ammonia 0, Nitrite 0, and 0 NITRATE. Where did all the Nitrates go? I'm completely stumped and cannot find an answer anywhere. I've also emptied about 10 gallons of water in the past 2-3 months, not that it should matter. I have about 50 very small feeder goldfish. Is my tank understocked? I'm assuming my plants are consuming the Nitrates so fast they are showing up undetectable, considering my Ammonia level is 0. Should i buy another 25 fish? Ok, lots going on here but I will try to get to the point. You need to make sure all of your exposed tanks are covered so they don't get sunlight or algae will always be an issue. Sounds like you have that under control though so good work! The only reason you would not have nay nitrates is if the plants are taking them up or you still have algae in pipes and other places that are using it up. You can step up the feeding of the fish to several times per day to boost this up as long as your system can handle converting it all. you may need more fish or just feed them more until they get bigger. Either way will work. Hope that helps! Thanks for the reply. I did have algae in the pipes. Especially in my 3/4" tubing for my sump pump. I addressed that problem and noticed a difference. I also increased my feed to 3-4x a day vs twice a day. My plants are doing much better. I noticed a significant difference in my green pepper production. Im still consuming all my nitrates. I ordered 25 blue tilapia. Hopefully they get along with my goldfish and up my nitrate levels.